Former Minister Wimal Weerawansa’s coordinating secretary Moratu Sanath alias Sanath Kumara, wanted by the FCID, has consumed poison and is being treated at ward 33 in Kalubowila Hospital say reports. Sanath Kumara has consumed poison after Wimal Weerawansa’s elder brother was arrested and remanded for misusing government vehicles when his brother was the Minister. 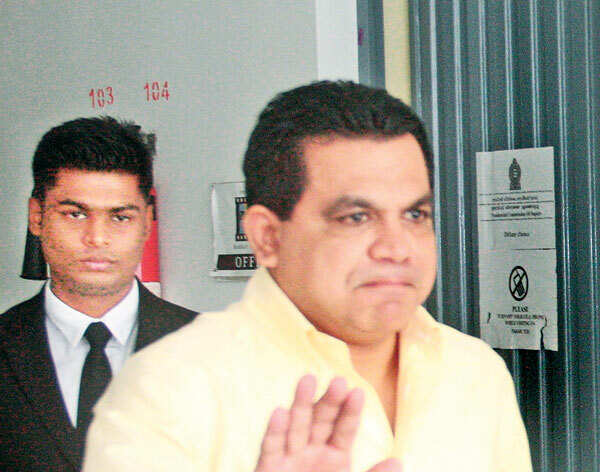 Wimal Weerawansa has visited his former coordinating secretary at the hospital on the 3rd. Moratu Sanath alias Sanath Kumara has come to Moratuwa from Matara area and media had reported that he had become a millionaire within a short time. The Chairman of Avant Garde Retired Colonel Nissanka Senathipathy and Retd. Maj. Gen. Palitha Fernando were arrested by the Commission to Investigate allegations of Bribery or Corruption today (6th) afternoon. The two of them had been summoned to the Commission to get statements from them regarding an investigation into crediting money to Palitha Fernando fund. The two of them were arrested after the statements from them were recorded. They are to be produced in Court. The Commission to Investigate into Allegations of Bribery or Corruption earlier filed action against former Defense Secretary Gotabhaya Rajapaksa and 7 others for unlawfully authorizing the establishing of a floating armoury and inflicting a loss of Rs.1140 million to the state. The counsel representing the Attorney General has told that legal action would be taken under Public Property Act against the former Judicial Medical Officer Prof. Ananda Samarasekera who is charged with misplacing skeletal remains of popular Wasim Thajudeen and stated that Prof. Samaraseskera is responsible for taking the skeletal remains in a lorry. This was stated when a petition filed by Prof. Ananda Samarasekera in Colombo Magistrates Court seeking anticipatory bail stating there was a possibility that he would be arrested as he had been summoned by the CID to get a statement regarding the disappearance of Thajudeen’s skeletal parts was heard before Colombo Additional Magistrate Mrs. Dulani Amarasinghe yesterday (5th). The counsel representing the Attorney General opposed the request by Prof. Samarasekera stating the above charges. The counsel representing Prof. Samarasekera has rejected the charges. The Additional Magistrate stated the decision would be announced on the 9th. Former JMO Prof. Ananda Samarasekera is the present vice-chancellor of the SAITM privet medical school! A Ford Mustang car used by Parliamentarian Namal Rajapaksa was taken into custody by FCID yesterday (5th). It has been sold to a businessman and was taken into custody at a garage at Kaduwela. The counsel representing Mr. Namal Rajapaksa had said the vehicle was imported for less than Rs.5 million six years ago on duty free permit given to Parliamentarians. However, the present owner of eh car says he bought the car for Rs.8 million. The ‘Voice Against Corruption’ (VAC) in a letter to the Governor of the Central Bank asks why no investigation has been carried out by the Central Bank regarding the bond racket committed during previous Governor’s term and how persons involved in the racket are still allowed to occupy their positions in the Bank despite two months have gone by since the appointment of the new Governor to the Central Bank. 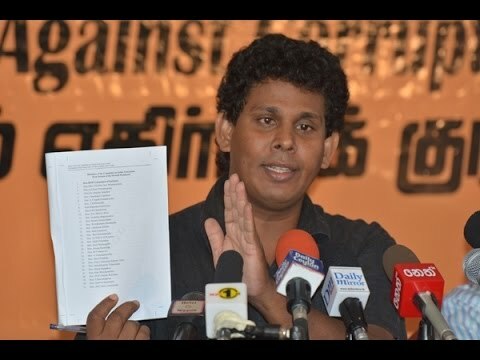 The letter sent with the signature of the convener of VAC JVP Central Committee Member Wasantha Samarasinghe has been referred to the President and the Prime Minister too for their attention. The letter also questions how officials connected with the racket including the Deputy Governor P. Samarasiri, who manipulated all moves on behalf of the former Governor, acted according to illegal directives of the former Governor, concealing errors and deceitful acts that surfaced now and then with false statements, bringing in incorrect and irrelevant arguments to cast aside just accusations and repress honest and competent officials, are still carrying on their duties in the Bank without any hindrance even during the term of the present Governor of the Central Bank. Five persons who had been in a gang that assaulted the High Commissioner of Sri Lanka in Malaysia Ibrahim Ansar at Kuala Lumpur International Airport (KLIA) on the 4th have been arrested by the security service of that country. The culprits were arrested after the security services released CCTV clips to the media and commenced a broad investigation. The High Commissioner was assaulted when he accompanied Minister Daya Gamage and party that had gone to Malaysia to attend the International Conference of Asian Political Parties (ICAPP) that was held in Malaysia. The High Commissioner and the other official who wee injured in the attack were hospitalized. According to information the members of the gang that attacked the High Commissioner are connected with the Tamil diaspora. However, Malaysian authorities have not revealed their identity yet.